I wanted to make Italian sausage in the Crock one day but all the recipes I found were covered in tomato sauces. They looked okay, but not what I was looking for. 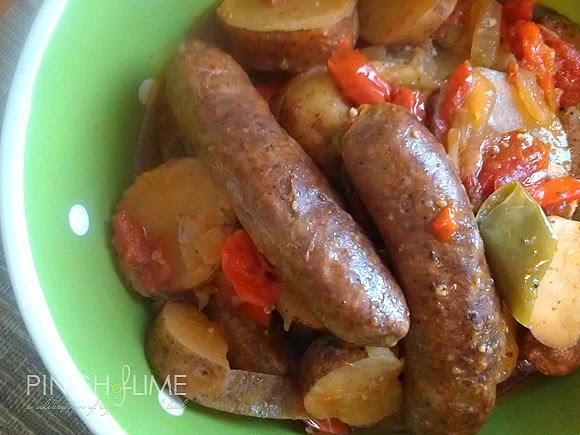 I didn't want the richness of the recipes I saw because I wanted the sausage flavor to really shine through. I also planned to include a variety of vegetables so I thought that creating a broth-type sauce would work very well. I did add some fresh tomatoes to my version for a little extra veggie goodness, but they most certainly didn't over-power the dish. Now, I do have to admit that I'm not a huge fan of Italian sausage. It's primarily because of the fennel. I don't like it at all. If I see a piece in sausage, I'll pick it out. But this time, I didn't mind any of it one bit. The fennel flavor mellowed as it cooked and the broth that seeped into the sausage made it very moist, tender, and full of such interesting flavors. We all loved it. The vegetables were also really good because they took on some of the sausage flavor but stayed true to their natural states. It's a very filling meal that is great on a Fall evening. It warms you up. So much, in fact, that I'm planning on having this cook up on Halloween so we have a great meal after trick-or-treating. And I honestly, can't wait to eat it. If you know me and my history of hating this sausage, that is quite a statement! 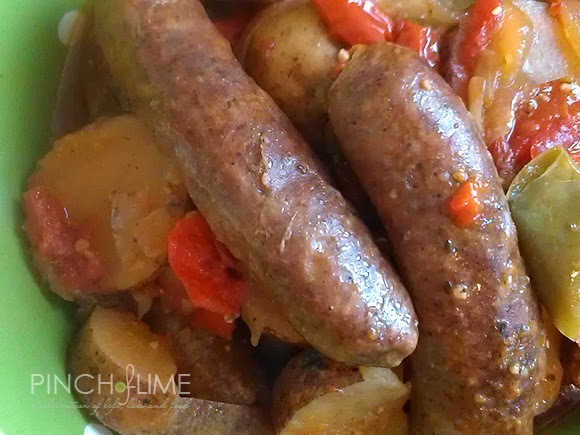 So even if you're picky about your Italian sausage, give this one a try. Mix sauce ingredients, omitting 1/4 tsp of salt. Toss with vegetables in crock pot. Nestle in sausage, sprinkle remaining salt on top, cover, and cook on low for 6-7 hours.